With a great arena, a hot hockey market, and a prime location near multiple franchises, the city of Lowell would be a great candidate for a new American Hockey League franchise. 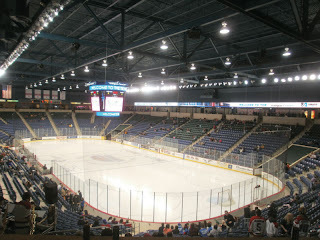 The last franchise, owned by the New Jersey Devils, left Lowell for Albany after the 2009-10 season. The lease beween the New Jersey Devils and the Tsongas Center ended in 2009-10, and was reportedly too good to be continued. In February of 2010, the University of Massachusetts Lowell took ownership of the the 6,496-seat arena. Later that year, Global Spectrum, a subsidarary of Comcast Spectacor, took over arena management. UMass Lowell provided renovations to the venue, including a new video board, LED sinage, and a new sound system. The result was an ideal arena for minor league hockey's highest level, the AHL. UMass Lowell continues to play at the arena, currently averaging 5,114 fans per game, which is good for 12th in the nation for Division I hockey. If college hockey can draw over 5,000 fans per game, than why couldn't professional hockey do the same? The Devils left Lowell one season before the Boston Bruins won the Stanley Cup, which has since boosted hockey's popularity to an even higher level. A low-priced alternative to NHL hockey could certainly have potential in this market in the present day. On the other hand, history does speak volumes. During Lowell's last season in the AHL, the franchise finished last in attendance, averaging 2,498 fans per game. Fast-forward to today, and the league average is currently 5,587. So can Lowell really keep up with the big markets in the AHL like Chicago, Cleveland and Houston? With the resurgence of hockey throughout New England, an exceptional intimate arena, and a perfect geographical location to other franchises, Lowell truly is an interesting market for the AHL. Interesting may not be enough to cut it, especially with the way the Devils finished in attendance in their final year. But with everything Lowell has to offer, this is not a market to be overlooked.